This Spring and Summer Dog and Cat Collar comes with a matching bow and features a Pink, Aqua, and Salmon Floral Theme. The bow and collar and be purchased with a matching leash and a metal buckle upgrade in the options when ordering. The collar can be purchased in either a buckled or martingale style. All collars are custom made and are available in any size or fabric of your choosing in my shop. Please contact me if you are looking for a particular color which I do not have on my site as I would be happy to custom make one for you in any fabric of your choosing. All images displayed are of collar samples only for viewing and all samples range in size from S to L. The flowers and bow ties shown with the collars are accordingly matched in size to the collar size. 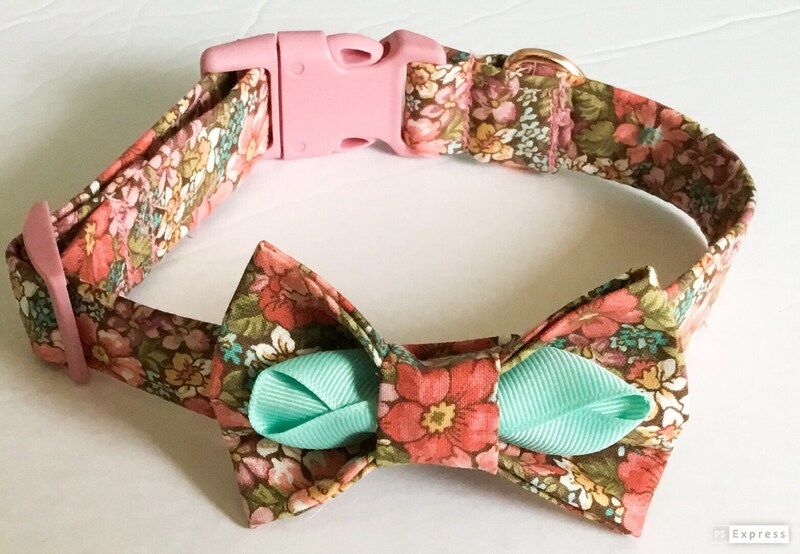 * All flowers and bow ties when purchased with the collar, will be in sized accordance with the collar size.unless a different size is requested.